It was Friday night so that meant we had two options: we could go out for a dinner out on the town or we could stay home and make dinner to eat while we watch the Olympics. I think you know how this story ends. 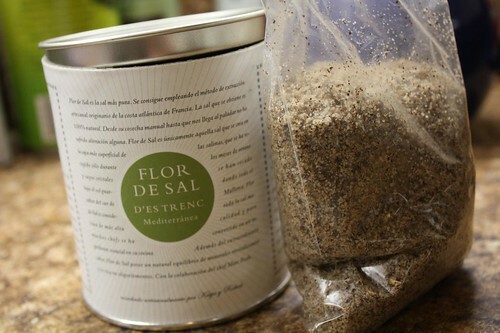 I used the second salt in my arsenal of seasoned salts from Gustomundial.com, the Mediterranean herbed salt which has summer savory, marjoram, oregano, thyme, and rosemary. 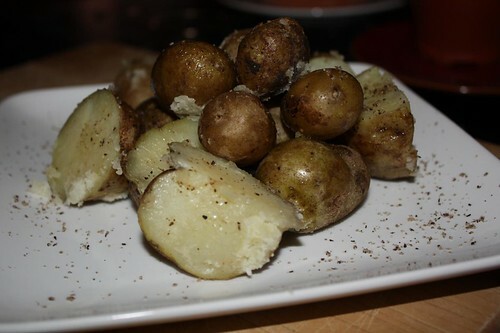 I used the salt with some of the last of the Kent, Connecticut potatoes, simply boiled in salt water. This salt was outstanding with potatoes. The remaining two salts are olive and hibiscus flavored. The olive salt I can think of a number of uses for. The hibiscus salt poses a little more of a challenge. I'll have something coming up for it soon. Perhaps a salty tea. For the main course I made stuffed sole. 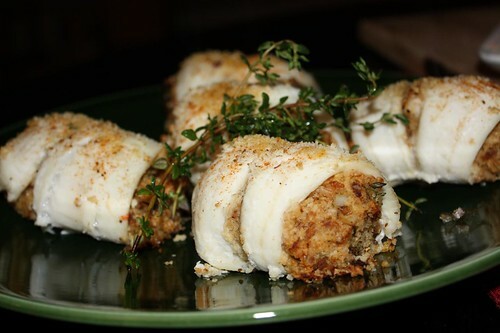 The stuffing was made with garlic, onion, celery, bacon, crab, scallops, shrimp, panko, butter, and a little egg. I then baked it in the oven with a little panko and Old Bay on top. I don't think I've made stuffed sole since the late 90's so it was a nice change up. Not exactly in the spirit of our recent healthy eating kick. I was originally going to stuff it with kale but I looked high and low and was unable to find any in the fridge. For that reason I substituted with delicious items instead. In the spirit of the Olympics I made five pieces, one for each of the Olympic rings. I thought about dying them red, yellow, green, blue, and black with food coloring but decided against it at the last minute. Largely because we don't have any food coloring. Also because it is a horrible idea. Now tonight we've been enjoying the skiing for about twenty minutes so I guess that means we're in store for about six hours of ice dancing starting any minute now. Just like they did during ancient Greek times.